Not Possible IRL: Oh, go be a kite! Oh, go be a kite! 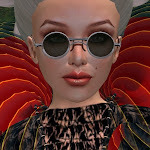 Let's just say you want to create an art installation in Second Life® that has lots of wriggly things that move like waves and open and shut depending on what side you are on, or emit a different sound for each phantom prim you traverse. If you are not a coder, then you'd do well to turn to Desdemona Enfield, who once scripted the acclaimed FlowerBall: An Interactive Thingy and DynaFleur. 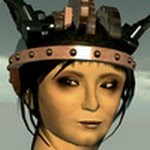 Desde has been busy, as usual, "developing projective geometry tools to, I hope, automate (or semi-automate) the reproduction of Firstlife structures (buildings, statues, landscapes) within a VR environment," she tells me. That's pretty much the kind of answer you can expect from Desde any time you ask, "What have you been up to?" So when Desde expressed interested in Blue Tsuki's art gallery, I hastened to invite her to prepare a guest blog post, and fortunately for all of us, she agreed. Meanwhile, photographer Stephen Venkman, who's work often graces these pages, and whose limited editions sell out overnight, spent a happy evening yesterday with his wife, Kimberly Mirabeau, playing with Blue's works and recording the moment. It gives me pleasure to share with you their combined impressions on the work of a new-to-us and highly imaginative artist, and Impossible IRL'er, too. With an exhibition at his Fine Art Gallery (teleport directly from here), Blue Tsuki (rez: 9/3/2006) presents three of his works: Kite, DNA, and Shadowbox. KITES is an array of kite strings extending from the ground into the sky, each having a stylized avatar shape at the upper end, its proto-arms extended as if flying in the breeze. 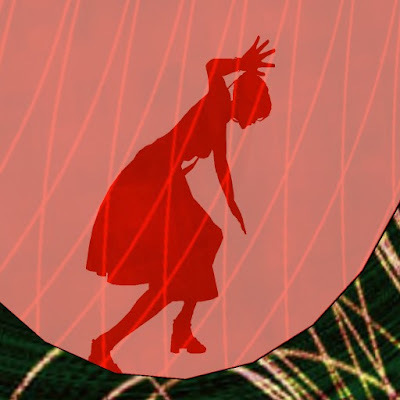 A visitor may either sit on the ground, where she grasps the string and leans back to brace against the force of the kite, or sit on the string, in which case she becomes the flying kite. As a one person experience, the scene leads me to contemplate the author-avatar relationship, the author being that mysterious entity that sits at a computer and breathes life into an avatar. 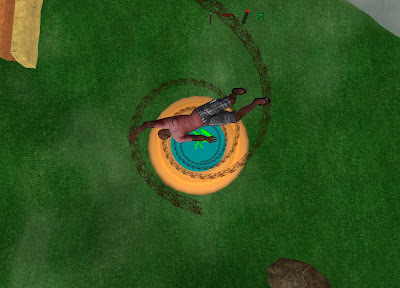 The avatar soars in the breeze of a virtual existence, light as a feather, totally free, except for the constraint that connects it to the author... a connection which, if severed by a logout, renders the avatar lifeless, fluttering to the ground of non-existence. Seen as a two person experience, I became mindful of the oscillating dynamic between two autonomous individuals. When one person chooses to be the anchor of the relationship, then the other is free to swoop and dive through life, zooming about, floating, exploring. Yet, as with a kite, the apparent freedom of the airborne person is conditioned upon the tension applied by the ground person. Should the ground person let loose the line, the flyer will fall to the earth. It is only in the tension between them that the exhilarating living experience becomes possible. After playing with this exhibit, I ran back to the reception and started asking total strangers, "Please, come fly me!!" As you might imagine, reactions were mixed. AVATARHELIX consists of two helical strands spiraling upward. 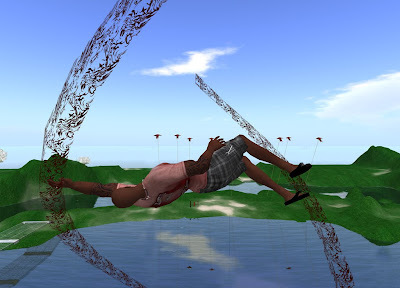 Between the strands, are pose prims which cause an avatar to stretch out and begin an animated rotisserie rotation, thereby representing one of the DNA links. The animation is subtle in that it moves the avatar in a manner that is consistent with arms and legs having weight. When I experience this sight, my mind tells me that we are our DNA, and that the information contained in the pattern of those interspiral links creates us... that we are an expression of the DNA, we are the links within the DNA. I asked Blue if he had hired a model and tied her to a large rotisserie grill in order to get the weight effect of that animation. He laughed and said that he himself had been the model.I congratulated him on a job done well, and expressed my concern that he had not been "well done." SHADOWBOX is a collection of screens and pose prims. When a pose is selected, the avatar disappears behind the screen and begins a slow animation. The shadow of the avatar appears on the screen. The screens are not passive objects. Each screen has a distinctive moving pattern that keeps you aware that both a screen and an avatar are present. There is a relationship between the screen and the avatar that creates the view that you see. There are numerous interpretations of projection which I will not bother to explicate. What fascinated me about the shadow box image was how distinctly recognizable they are. That was definitely my shadow on the screen. This illustrates that my outline is a significant aspect of my identity. It left me wondering if my mental focus on clothes and makeup is, perhaps, an aggrandizement of what are secondary details of my personal presentation. Also at his gallery is a display of his earlier works. If you sit and contemplate "SleepWalker," you will see an exposition of our relationships to our avatars and our dreams. If you take a friend and you both pose within "tunnel vision1.6," you will each have the sensation of that marvelous sense of energy flow between people that draws them into each other as if they were magnets. There is more, and I suggest that you explore. Escher coming out of the pixelworks! Fantastic ape avatar - Who made this? Now THAT's a piece a hardware! Just a few days left! "Mixed Realities"